I was all set to refer to this guy as "Mustache Dad," but then I realized that's the guy from Twilight. All these parental policemen kind of run together. 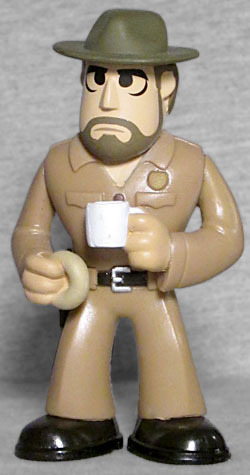 Officer Beardface, here, comes to us from Stranger Things, which I still haven't seen and still don't have any immediate plans to. It's on the Netflix list, but so are a bunch of other more interesting things. He's the sheriff of Forks, Washington chief of police in Hawkins, Indiana, where apparently the uniform is as khaki as the day is long. His pants and shirt are both the same color, separated by a dark brown belt with a gun sculpted in the holster on the hip. His shoes are the same dark brown, with black soles. He tops the ensemble off with a desaturated brown hat, nearly the same shade as his face-sweater, meaning he can hang out with Rick and Carl and they can all protect themselves from the sun together. Deputy Dadbod's actual name is Jim Hopper, and he's played by David Harbour, aka "Elliott Hirsch in The Newsroom." He's also the next guy to play Hellboy. The Stranger Things Mystery Minis have sort of a School House Rock aesthetic to them, befitting the show's setting and love for the '80s. So there's not really a likeness to speak of, allowing the day to be carried by the costume and beard. 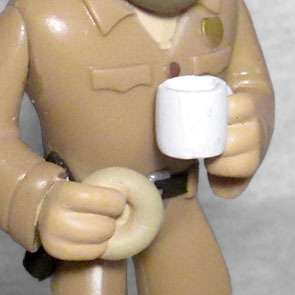 Because he's a cop, the figure shows him holding his coffee cup and a doughnut, neither of which do anything to up the colorfulness of the toy - it's all pale earthtones everywhere. You might have expected them to paint the interior of his mug brown, but nope, it's empty. Or he's drinking milk. The Stranger Things Mystery Minis don't have a specific layout, but if you want this 1:72 figure, the fact that he's an adult in a line full of mostly children should at least give you a fighting chance of finding him just by shaking the boxes. This entry was posted in blog exclusive review, Funko and tagged Mystery Minis, Stranger Things. Bookmark the permalink.